I am such a bad blogger - I told you about my M&S haul on Facebook & Twitter and then didn't take the photos to show you what I got. And as I'm a very discipline 'returner' of products, the haul has reduced already as I've brought some of it back. Whoops! Click on the link above to see the lace detail - I can't seem to download the picture of it. These tops come up quite snug as most thermal wear does so I bought a 12 but a 14 would have fitted me also. Definitely getting one more of these. I bought loads of cotton vests in different colours. 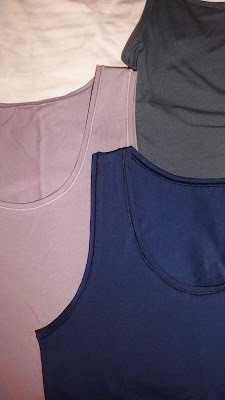 These are great for under cardigans and v-neck tops. It's a good way of introducing another colour to an outfit and I'll show you how I've done that with one of these tops tomorrow. Cheap as chips - 2 for £5! Can't find these on sale online - just full price ones. The only difference between mine and the one on the link is the colour. It's impossible to capture on camera but the pair I've bought are a murky grey/green. A very versatile neutral colour that will work all year round. Reduced from £29 to £19 and I promise not granny-looking in real life. Thanks to my lovely broad feet, I can only buy my pumps from the M&S or Clarks wide-fit range …admitting that is making me feel very old! The Owl Dress is reduced too! And it goes without saying, stock up on the undies while you're in. I couldn't find a matching set to fit the day I was there, despite having my 8 year old helping me. His loud gasps of amazement at the 40GG bras did shorten the time we spent in the lingerie section though! See you all tomorrow…. Love the look of the cocoon thing, but if it keeps annoying you probably not a keeper...? You never know the tricks the retailers go to in order to get stuff to look good for the pics - and we all know about M&S photos!! Some great buys Avril, I have a cocoon type cardi and I can comfim it's bloody annoying, I spend ages tugging and pulling at it to get it to sit properly. I have the opposite problem with shoes I have narrow feet which is also a nightmare. I like to stock up on my basics after new years too. I am so gutted I missed the boat on the owl dress, I was coveting it full price! I love the M&S heatgen collection. I have at least 7 pairs of the thermal leggings and some of the 3/4 sleeve heatgen tops and long sleeve heatgen bodies. If you're looking for petite thermals, these fit the bill nicely and are available from a Size 6. I have 4 heatgen long sleeve tops/bodies and two heatgen vests which I have worn to death this winter. Love their thermal socks too. 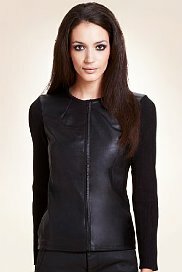 I bought the Heatgen Cowl Neck Rear Lace Thermal Top in black a month or two back and it is great for outer and under wear. Very cosy but nice with the lace! I'm a great returner. I think I love the thrill of the buy and when I get it home, find out it's not quite perfect and then it goes back. Even the £3 items! And if you have a limited budget then the returns are absolutely necessary! "the pair I've bought are a murky grey/green"
I'm a returner too. Better to make the effort to take things back, I find, than to have to make the effort to take them to the charity shop 3 months later! 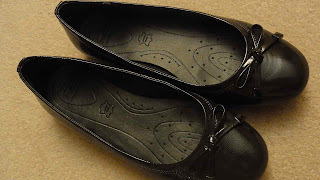 I've had the footglove ballet pumps before and loved them. Was excited to see tham at £19 as I have a £20 voucher to spend. Like you said full price on website. Might have to pop in. At last I get to comment on your post! but it takes me forever but am now back on the computer - yay! - anyway I have ordered it and will let you know! I agree with you about taking things back, I much prefer to try things on properly at home and then if they don't suit I bring them back promptly otherwise they are stuck with the other mass of stuff at the back of the wardrobe. I bought the lambswool blue tunic before Christmas and also got it in grey, it was a great buy as I have worn them both and they are very easy wearing. Oh Fiona, I do love your comments - thank you! Do let me know how you get on with your cocoon…I sent mine back! I am saving for a trip to London so am being ruthless about returning. I wish now I did get the tunic but there were only big sizes left in the shop at the weekend. Just as well I suppose but you've confirmed what I suspected - it's a very wearable tunic. Oh and to answer your question, my twins aren't identical but I'm guessing it will be interesting when they get to that dating stage…if one gets a date and the other doesn't. Hope your daughter had a great time - she better not get them mixed up!